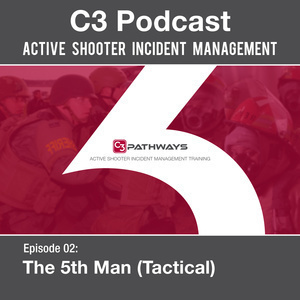 Hello, Bill Godfrey here from C3 Pathways, we're here today to talk a little bit about fifth man and the tactical position, a key position, in the management of an active shooter event, certainly on the law enforcement side, but really, for the entire event. And I have with me today, to talk about it, Steve Shaw, sergeant with Chapel Hill, North Carolina. Ron Otterbacher, who's retired division chief from the Orange county sheriff's office. And retired sheriff Kevin Beary, also from the Orange county sheriff's office. Guys, thanks for taking the time to come and talk with us today, Ron, what do you think. You've been around the block teaching this block for a long time, why is that fifth man and tactical position such a key element of managing these things? We actually got the fifth man concept from a lieutenant colonel from Memphis police department, he was trying to get his arms around not knowing what rank would arrive at a certain time, however, he wanted to make sure someone took control of the situation at appropriate time. That's how that came up, and then we kind of finessed it a little bit so we were able to use the action of that position as one of the critical positions in the incident command spectrum. And, what we want to do is, we know contact teams are going to be going in, the fifth man concept doesn't have to be actually a fifth person, or the sixth person, or seventh, just after the initial contact team goes in, and we've got resources down range, someone needs to stop and take control. If they don't take control, then it increases the opportunity for a blue on blue situation, it also makes it so we lose control of where our personnel are, and who's been deployed, the number have been deployed, so that's why it became so critical, and that's why we put it in the forefront of what we teach. So, Stephen, you've done a number of these training scenarios with us as well, as well as going through them on your own. You know, what sticks out in your mind as the key things that fifth man really has to do, that that tactical position has to get their arms around and focus on, and what are the things that they shouldn't be focused on, that they need to get out of their head? I think the biggest thing when we're talking about, you know, we talk about two enemies, the bad guy and the clock. With that comes the second enemy, the clock, the important part of that is efficiency of resources. Putting resources where they need to be and a proper amount of time. So, you have to have somebody there who has a good situational awareness, who is able to say, contact team one has done this, so I don't need to send another contact team to clear building A, because contact team one's already done it. So, contact team two can now start working on clearing building B, I need a rescue task force, I need a second rescue task force here. Because they're so far down, a lot of times what we refer to as incident command as being down into the weeds, because they're so far down into the weeds, they can't be thinking about things like, reunification, calling in, you know, putting out press briefings. Those are big picture items that the incident commander needs to think of, so that that fifth man, that tactical position, is about focusing on controlling everything that's going on inside that inner perimeter, so that we can get help to the people that need it, and the most expedient manner possible, making sure that our resources are used most effectively. It's interesting, you're describing it really almost in a strategic sense, for deploying of the resource. But let me ask you this, you know, why do we need it? What, is it, what's the consequence if we don't do a fifth man, if we don't have a tactical, and just letting the contact teams deploy and do their own thing? I think the most glaring example is the navy yard shooting, where we had a suspect on the loose for over an hour, and over a hundred, 117 officers inside the building looking for the shooter. No one took charge and said, "Contact team one, lock down this stairwell, contact team two lock down this stairwell." So, we had a bunch of officers who were freelancing, who were looking around for different, who were looking around for the same task, but they were doing the same thing over and over and over again. Again, we talk about speed, we talk about efficiency of resources, somebody needs to step up and say, "This has been accomplished so we can mark this off. Somebody stay here, leave it secure, so that we can move onto our next list of items." If we don't, we end up doing the same things over and over again, or we just lose accountability for people. Interesting point, you mentioned the navy yard, by the way just, I want to make sure I'm following you on that clarification. You're talking about, when you say the officers freelancing, you're really meaning they just doing their training, move in, move to the sound of gunfire, without anybody kind of, you know, for lack of a better way to say it, being the quarterback and kind of putting the team where they need to. That's what you're talking about right? Yeah, Kevin, you know, you're coming in with a really interesting, broad perspective. You know, 16 years a sheriff, overseeing a lot of stuff that's gone on in a fair amount of time deployed in some tough areas overseas. And kind of a fresh perspective on this. How do you see it fitting together in terms of getting from that initial first few officers that are going in to neutralize the threat, and then, managing this just massive response that unfolds. What's your take on the fifth man? Well, I think the fifth man is probably one of the most important persons that's going to be responding to the scene. The first thing is you need somebody that's not afraid to take command. And, second is, listen to your contact units, get as much information as possible from those contact units, how many officers are hurt, how many survivors do we have, how many people down? And, you're already processing that information, when you take that fifth position, you need to make those decisions, coordinate it with your fire department and medical resources, and triage people, it's very important, because now, most of the contact positions, those people are gonna already have the person down. This thing is over in usually just a couple of minutes. But now you're fighting against the clock, and that fifth person is responsible for getting that clock, you know, kind of curved back as much as possible. Really, really good point, Steve was mentioning the clock as well. Ron, talk a little bit about battling the clock versus battling the bad guy a little bit. Kind of paint that picture for those that are listening in on what we're talking about, and how fifth man a tactical plays into that. Battling the bad guy is pretty self evident. We gotta bad guy that's creating problems for us, we're trying to go and stop the killing, then we try to stop the dying. Stopping the killing is critical, but even if we don't have the bad guy completely locked down, we can still work on stopping the dying, which is, again, battling the clock. We can get people down range, they can render aid, while we're still going after the bad guy, in a safe fashion, or as safe a fashion as we can make it. As we look at this, we want to make sure that the sooner we can get to the damage, the sooner we can render aid, whether it be with tourniquets, or direct pressure, or whether it be wound packing or anything else, that, we've got the opportunity to keep them from bleeding out. And, we also know that the best way for them to have a successful outcome in this entire situation, is getting them to the hospital and getting them into surgical ward, so the surgeons can save their lives. We'll try and slow down everything, and it all plays into the clock. We've got a, make sure we know what we're dealing with, which is what the contact teams are painting a picture of what they see, what they're dealing with. And then, at the same time, they'll tell us we're able to send our rescue task forces in, and they'll also tell us where we'll able to set up our ambulance exchange point to get the patient out as quickly as we can. You know, Ron, you're talking about the role of the contact teams and tactical play in the medical piece of this, from the fifth man's perspective, and who becomes the tactical group supervisor, talk a little bit about the role that triage and transport from the fire department or EMS, how do they work together? Paint that picture on how that plays out and the goodness of them, the goodness and badness of them working together versus not working together. Well, actually it's a great thing, and it's, what we've done is we've co located triage, transport, and tactical together. That way we don't have to go through the communications tree to get a message passed on. All we've gotta do is turn to our left, turn to our right, and say, "I need this, or I need this." Whether it be tactical asking for a rescue task force, they turn to triage, says, "Look, I need two rescue task forces downrange, this is where I need 'em. We've got security in place." Or, transport saying, "Look, we're setting up our AEP here, I need a cover team to provide cover team for the AEP." Turns to tactical, say, "I need this cover." And he turns around and calls the contact team and said, "I want you to provide cover for the AEP and this is the location." So, it works great, the communication is unobstructed, you turn to each other, as long as you pay attention to each other, and we see from time to time, we're governed by our radios, and it would be a lot easier if we were just to turn and tap them on the shoulder, and say, "Here." Stephen, I know you've experienced some scenarios where tactical was removed from the medical component, and they were trying to kind of coordinate it remotely over the radio. Can you talk a little bit about some of the challenges that you've seen in those instances, and, you know, maybe some of the pitfalls that can be avoided if you get the medical folks, and a tactical person, you get them together working together? I think the main thing is air time. There's a lot of people are gonna have something to say, it's gonna be a battle just to get air time on the radio in order to talk to somebody. A second aspect of it is, law enforcement can, officer and whoever's running the medical side of it, are more, sometimes, are more than likely gonna be on two different channels. So, you either have to switch your channel back and forth, or have a second radio, or have a communications aid. And then, the other thing is, we talk, everybody, I think, has played the telephone game, where you line up in a row and somebody tells the first person in a row something, and you whisper it into the next person's ear, and by the time it gets to the end, it's a completely different message. Messages, through no fault of anybody's, sometimes get muddled over the radio. Whereas, if we're sitting right there together, we can look at notes, we can hear what we're saying face to face, we can hear each other's radio traffic. If we have to call on the telephone, or we have to say something over the radio, by the time it gets to the intended source, the message may be different than what the original message was. In addition to the fact that, with the air time, and with the other channels, it may not be timely information anymore. Information is constantly evolving, especially in an event as dynamic as an active shooter. You may have your casualty collection point set up in one place, and you're sending RTFs there, and then all of a sudden, your threat is no longer contained, by the time that information gets relayed to the people that need it, it may be too late. Kevin, you know, you've had, obviously a lot of experiences a command officer, you know, working some pretty challenging events. Certainly overseeing them, and certainly being on the hook and being responsible for them. Can you talk a little bit about the challenges and the guidance that you would offer to, you know, people who are on the job, who are going to find themselves in command, or in these management roles, of trusting the people downrange, and the importance of letting the people downrange really kind of drive the lay of the land, as opposed to trying to dictate it from top down. Can you talk a little bit about that, because my sense is, is that that's a pretty big deal in the tactical environment. I think it's a pretty big deal in law enforcement in general. You have to surround yourself with people that you trust. And, for a chief of police, or a sheriff, the bottom line is when those people get sworn in, you gotta trust them, they're going to be carrying out that everyday mission. And in this particular incident, when you're sending people down range to an active shooter, and your initial folks are reporting back, of what they see, and the casualty numbers, and what have you, very important that that person takes command. Because that fifth person is going to be the initial incident manager, who is going to have to paint a clear picture for when he gets relieved, and ultimately to that incident commander. And it's that initial trust factor, that you got people down range, they're giving you the information that you need, you're collecting that information, and you're passing it on. It's the picture clarity, so that all law enforcement responders, and all fire responders can get there and start saving people's lives. So what, from your perspective, what's the consequence, you think, of having folks downrange that are, you know, telling you X, and being back at the, you know, command post, or somewhere remote, and saying, "man, I think Y's a better choice." Can you talk a little bit about some of the challenges there, because sometimes, you know, there might be some appropriateness to that. But other times, you gotta trust the people that are down range don't you? In an active shooter situation, I guarantee you that it's the people down range, they're seeing it first hand. The person at the command post, is getting that second hand information. You've gotta trust them to make the right decisions, and, if you don't, then the situation could get muddled very quickly. Ron, I've heard you talk a lot, when you're doing coaching the tactical position, coaching the fifth man position, about task and purpose. And making sure that when you're pushing resources downrange, contact teams, or rescue task forces, you know, in conjunction with Triage, you're pushing them with a task and purpose. Can you talk a little bit about, why you think that that's such an important element or important component of that function. Sure, when we talk about task and purpose, we want to make sure that they've got an assignment, they know who they're working for, they know what channel they're on, and they know what their responsibilities are. If we just send them downrange, to do whatever they decide looks good, then it may not fit in the concept of command and control for the overall incident. Everyone that goes downrange, doesn't matter if it's contact team, doesn't matter if it's rescue task force, doesn't matter if it's an ambulance for the ambulance exchange point, they've all got to know what their responsibility is, who they answer to, and what they should be doing. I also need to let them know what my expectations are. If I send them down range, I'm gonna tell them, "And I want you to report back to me as quickly as you can, to let me know what's going on. I want you to constantly paint a picture for me, so I have a better understanding of what you're seeing. You are my eyes, you are my ears, and that's what I have to count on." The task and purpose, simply clarifies what that is, and what I need from them at that particular time. So, Steve, let me see if I can kind of sum this up, because it occurred to me, the way we started we may not have really explained, where the fifth man comes into this thing. So, we've got an incident that goes down, you've got your first contact team of officers, presumably three or four officers that are moving downrange, and what we're looking for is the fifth officer that arrives, again, as several of you have said, it may not be the literal fifth officer. But, once you've got a contact team downrange, you need to start thinking about getting your arms around it, and getting some command and control around that. So, that fifth officer that arrives, that's gonna take temporary control of this, or temporary charge of it until the incident commander gets there, supervisor gets there. And they're going to marry up with the fire department or EMS for triage and transport. How do they pick a good location? Talk a little bit about, you know, where do they need to set up? How close should they be, how not so close, how does the fire department get up to them if they're too close, you know, kind of walk us through what that looks like or what that life cycle might look like for a fifth man from the moment they take it, you know, as they slide into tactical and start working it with triage and transport. So, I think the first key component of that, is as that first contact team is arriving on scene, they give that good size up report, where, they're saying what they're seeing, what they're hearing, are they hearing what sounds like, to them, rifle shots? Are they hearing pistol shots? Are they seeing IEDs there, because that information changes how big your hot zone is. If I'm dealing with somebody who's got a rifle, my hot zone is gonna be pretty big, because that round can travel pretty far. If it's a building, and they're contained in a building, my hot zone then shrinks, no matter what weapon they have, because they're in a building. So, that initial size up report from the contact team is vital to getting that information. I would say, if you're that person who's gonna be that fifth man, you start big. We can move closer if we need to, but it's very difficult to back out. Pick a place that's fairly close by, but it's still far enough away that you know that you're not in the hot zone. Police officers and firefighters, EMS and ambulance personnel, we have a different definition of what's dangerous, and it's not because police officers are better than any of these people, it's just because we have guns and we have vests and we deal with this kind of stuff all the time. And, sometimes, we fool ourselves into thinking that we're safe when we're not actually safe. And so, if you're that person, you have to put yourself in the mindset of, "If I didn't have a gun, if I didn't have a vest, I don't have any armor, and I don't have any training, where would I want to be?" And that should probably be your starting point. But that, the information that you get from the first contact team is vital. And then, the next thing is, you have to think about what is a realistic location, because you're gonna be kind of in that warm zone. There's a good chance that some of your contact teams are gonna want to come, or a perimeter group is gonna want to come and make a face to face to you, so you can't be a mile away. But you have to be close enough where you're still effective, but you're far enough where you're out of the danger zone. So, you have to be, it comes with familiarity with your area, kind of that, as police officers we talk about a when/then thinking a lot of times, when this happens, then I will do this. So, as you're on your regular patrol, be thinking, if you're that person, who you think you might be in that position, think ahead of time, if I was to have an active shooter at this location, where would be a good point, a good location for me to put my initial command post? And then you can change it based on the information that you have. But that information that you get there, put, not thinking like a cop all the time, thinking like somebody, thinking like somebody from another profession, and then the pre planning I think are all keys to this. You know, that's a great answer, and really appreciate that rounding out that problem. That's our time for today, guys, I can't thank you enough for taking the time to sit down and talk about this stuff, and I look forward to some more of these as we move forward. Thanks for your time.